"It's really cool, the way that David Ayer works. It's all images, all ideas, and he holds the screenplay [pretty close] and he just keeps sending you things about your character. He just wants you to be prepared for anything." It's possible, knowing Will Smith and Margot Robbie would be doing press for Focus this month, that they weren't given the screenplay so no details would be leaked to the press. However, Margot Robbie added that the story is "ever-changing." "I'm really looking forward to it. We don't know what our characters' relationship is really gonna be [because] it's ever-changing. We're not being secretive, we just actually don't know." 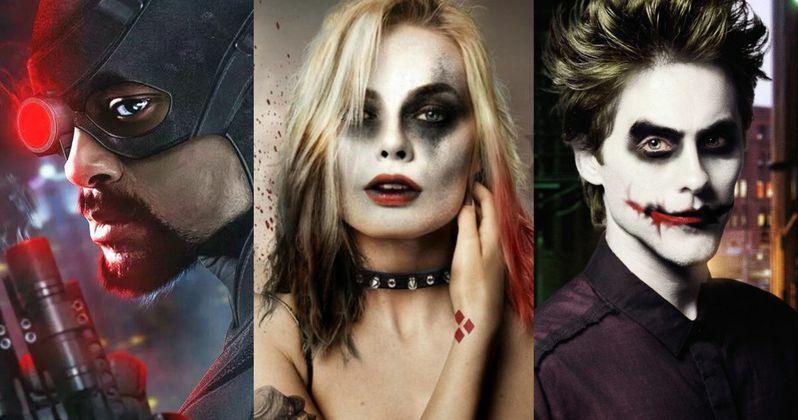 Will Smith added that Deadshot and Harley Quinn are "allies" in the movie, but said that they don't know what's happening with the other characters. "[Ayer] only sends your character's stuff so you don't know what's going on with the other characters; I think he wants it to come alive on set." This won't be Will Smith's first time playing a superhero, following his turn in 2008's Hancock. When asked how Deadshot differs from Hancock and his character in Focus, the actor had this to say. "I guess I like the concept of dubious morals. I always liked to play in that area. With Suicide Squad, we just started on that. I think I haven't explored the psychology enough of Deadshot, somebody who could take money to kill people; how he justifies that for himself. So, I still have a little bit of work to do on that, but in my life in general and in my career, those are the type of roles that I'm pushing more towards; those kinds of questions."